Millions of years ago, one species of frog diverged into two species. Millions of years later, the two frogs became one again, but with a few extra chromosomes due to whole genome duplication. 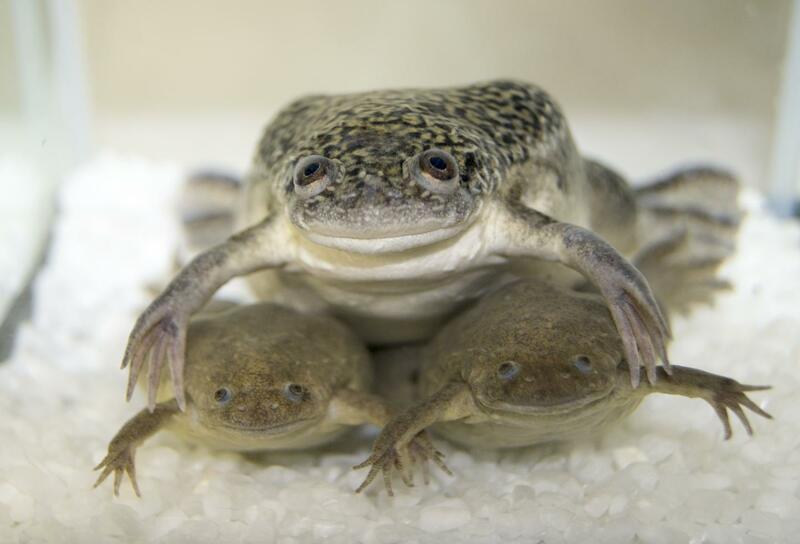 Such is the curious case of the African clawed frog, Xenopus laevis, a frog whose genome contains nearly double the number of chromosomes as the related Western clawed frog, Xenopus tropicalis. In the evolution of species, different events have occurred over millions of years that have increased the number of chromosomes in some organisms. Polyploidy describes an event that increases the number of copies of each chromosome. Vertebrates have undergone at least two different polyploidy events since their original divergence. While it is relatively rare nowadays to observe a mammal, reptile or bird with an abnormal number of chromosomes, polyploidy is common in fish, amphibians and plants. Prof. Daniel Rokhsar, Professor of Genetics, Genomics and Development at the University of California, Berkeley and head of the Molecular Genetics Unit at the Okinawa Institute of Science and Technology Graduate University (OIST), Prof. Masanori Taira from the University of Tokyo and Prof. Richard M. Harland from the University of California at Berkeley led groups of researchers in examining the genome evolution of the African clawed frog. This large, collaborative project included scientists from a variety of universities and institutions across the globe. The study, published in Nature and featured on the cover, revealed that the X. laevis genome is comprised of two different sets of chromosomes from two extinct ancestors. Dr. Oleg Simakov, a postdoctoral scholar in the Molecular Genetics Unit at OIST, developed an algorithm to determine the length of time, in millions of years, between the divergence and subsequent fusion of the X. laevis ancestral species. In order to be able to calculate these times, the X. laevis genome had to be correctly annotated. Annotation involves identifying which regions of DNA contain coding genes or non-coding regions. While automation can simplify this process, many mistakes are made. Dr. Yuuri Yasuoka of the Marine Genomics Unit at OIST helped to manually correct the gene annotation. His graduate studies at the University of Tokyo under the guidance of Prof. Masanori Taira allowed him to develop the skills necessary for his role in this project. "Taking advantage of my experiences on the field of developmental biology, I examined genes involved in developmental processes," he clarified. Dr. Adam Session, a former graduate student in Prof. Rokhsar's lab at the University of California at Berkeley and co-lead author of the Nature publication, elaborated "The most exciting finding from our study is that we can partition the current X. laevis genome into two distinct sets of chromosomes, each descended from a unique ancestral species. While plant studies have been able to show similar results using related species still in existence, this study is the first time this has been done with two extinct progenitor species". This large collaborative project resulted in new knowledge of genome duplication that can be applied to evolutionary studies of other organisms. "Because X. laevis is a well-studied model system for cell and developmental biology, it is ideal for to studying the effect of polyploidy on evolution," Dr. Simakov explains.